Alphabet Soup Blog » Blog Archive » Terry Chouinard Needs Your Help! Terry Chouinard is a master letterpress printer. Letterpress printing is a craft that is slowly disappearing, but there are still some great practitioners out there keeping it alive. Mr. Chouinard has invented a device that will greatly enhance their ability to keep ink colors accurate and consistent throughout a print run—no matter how big or small. One of his followers wrote a really nice piece describing what he’s done on her blog Quince & Quire. He’s looking for small investors to be able to make his “Ink Dial” a reality—and has posted it on Kickstarter. 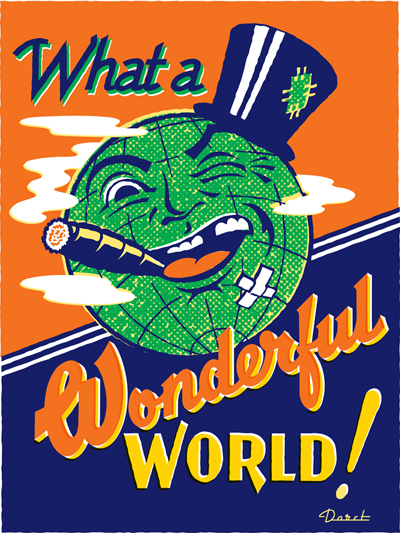 Terry asked me to donate a piece of art so that he could offer a signed, limited edition, letterpress version of it as a reward to investors, and I gladly offered my piece “Wonderful World”. For an investment of as little as $35 a beautiful hand-printed 18″ x 24″ letterpress version of this art could be yours. There are 14 other artists who have committed art to Terry to try to help him get his Ink Dial off the ground. Please check out this very worthy project. The more you donate the more prints you could be rewarded with by the likes of Marian Bantjes, Andrew Byrom, Paul Shaw and Jack Unruh. His deadline on Kickstarter is coming up soon—take a look and see if you don’t want to support this very worthy project.